This web site holds local climbing information for the area around Huddersfield, in Kirklees West Yorkshire, currently it covers four of the larger venues and six smaller ones with some limited detail and example problems from the other venues. The ongoing aim is to expand this coverage to all the other crags in the area. Constructive comment is always welcome. The British Mountaineering Council have a great website with loads of useful information and advice. Click on the logo above or the link below for more information. When you have an accident or get into trouble on the hill or at the crag it's mountain rescue that come to your aid. Holme Valley Mountain Rescue Team relies on donations from the public for the upkeep of vehicles, equipment and vital medicines. All donations are gratefully received. There are various ways to donate, see the website for more details. This is a 2 item snippet of the latest news. After the success of last year’s event, Milnsbridge Enhancement Group and Huddersfield Climbing Centre will be running another day of free training sessions for kids and adults on the Milnsbridge Climbing Boulder on Saturday 20th August from 12:00 until 16:00. The instructors will train users on how to improve their climbing technique, how to get the most out of it, how to use it for training and most importantly how climbers and their friends should use it safely. The event features two sessions of instruction: from midday until 2pm, a session open to all, to which people can just turn up and register on the day. Then from 2pm-4pm, more tailored training sessions will be offered to individuals and small groups. There will be a free BBQ lunch for participants, a prize raffle and freebies. 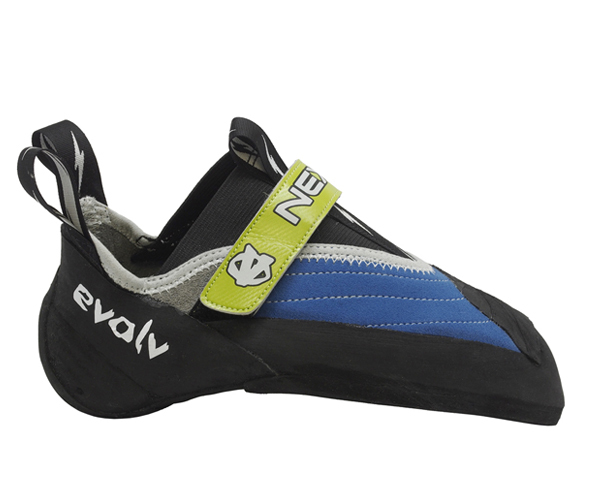 A few weeks ago those lovely people at The Crag Station gave me a pair of Evolv's newest climbing shoe, the Nexxo, to try out. As you can see from the picture below the Nexxo is an aggressive, high performance slipper. Chris Sharma has been involved in the design and production of the Nexxo from the very beginning and you can really tell that a lot of thought and years of experience have gone into this shoe. Aimed at the hard bouldering and steep sport climbing market with the focus on performance I couldn't wait to pull these on a see if they lived up to the hype. First impressions were good, very downturned and aggressive, a good amount of rubber on the sole. The rand, top of the toe and the heel are also well covered in rubber stickiness. The inside of the toe box has a microfibre lining which improves the comfort. With a slipper of this shape getting them onto your foot was never going to be easy but the 3 well places loops give you enough purchase to hold the Nexxo in place as you drive your toes round the instep and into the shoe. As you would expect from a shoe shaped like this the Nexxo performs brilliantly on steep ground. Edging is solid and the firm yet flexible last means you can stand confidently on the smallest of chips but still feel what is going on between your feet and the hold. Normally using a new shoe to rockover onto a high heel or smear on a volume would instil a little uncertainty. The snug fit and responsive sole on the Nexxo meant the thought didn't cross my mind. I often suffer from a 'hot spot' on my big toe knuckle with a new downturned shoe and the Nexxo was no different, the give in the upper however, made this more bearable and I think after a half dozen more sessions they'll be as comfy as my old well worn in Shamans. It's obvious that the Nexxo is never going to be your gritstone slab smearing shoe of choice, that's not what Evolv built it for, but the sensitivity in the sole combined with the sticky rubber meant I didn't feel out of sorts on my local grit circuits. The Nexxo is a very snug fit on your foot. As it's a slipper with a single velcro strap a secure fit is essential and the Nexxo doesn't disappoint as it hugs your foot and inspires confidence. The sizing is a little different from it's nearest cousin the Evolv Shaman. Most people, including me, have gone up a half size from the Shaman to the Nexxo. For reference I'm a 8.5 in an Shaman and a 9 in the Nexxo. Across the top of the foot the Nexxo is pretty tight, but due to the supple nature of the upper it doesn't as restrictive as other aggressive shoes. If you've not tried an Evolv shoe with the 'Love Bump' and 'Knuckle Box' combination before but you want a precise and aggressive shoe without the associated pain then you need to try the Nexxo. Straight out of the box the Nexxo is easily the most comfortable, down turned performance shoe I've worn. The heel is snug and well protected but supple enough to be able to feel what's going on when hooking. 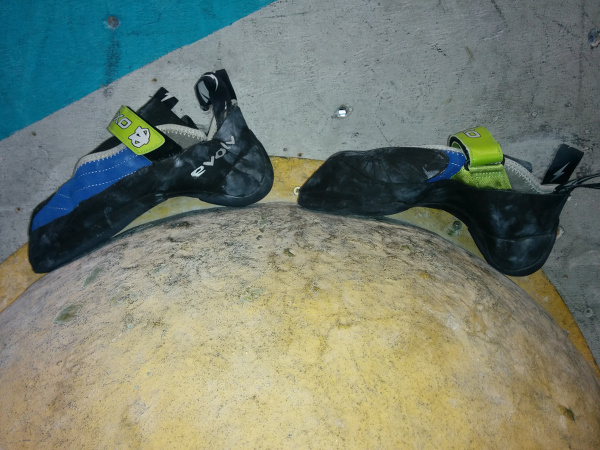 The toe is very precise and the power transmission is great on small holds and edges. Evolv have got the balance between thick enough rubber for durability and thin enough to maintain feel and feedback just right so the Nexxo should last you as long if not longer than other performance shoes. Only time will tell if the 'Epow system' helps the show retain it's downturned shape as the shoe ages but it's holding up pretty well at the moment. New to the Chris Sharma Signature Series, the Nexxo represents for Evolv a new way of approaching how we build shoes, how we engineer performance, and how we bridge to a higher level of design. It is soft yet it is powerful. It is convenient and it is precise. The Nexxo ushers in a new era of Evolv's Ultra-Performance climbing footwear. Profile: Downturned asymmetric with "Knuckle Box" and "Love Bump"
At meetings with the owners of the crag, local residents and climbers the issue of parking on Cliff Road has been raised. Climbers were asked to be more careful when parking not to block drive ways or park in front of people houses. When visiting Cliff please park away from the houses at the foot of the track as the residents there have problems parking. There is plenty of parking back up Cliff Road towards its junction with Cliff Lane, which is better, away from any houses and also provides a little warm up walk in. On this site we use the Fontainebleau system for grading boulder problems. This is done for a number of reasons, the main one being that for venues with the majority of problems in the low grades the Font system works better and is clearer than the V grade system. Previously we've used a combination of the V grade and the UK tech grade which can be confusing. The forthcoming Yorkshire Mountaineering Club Gritstone guidebook, which features some crags in the area, will also be using Font grades. Any routes on the guides will be graded using the UK adjective grade and technical grade as before. Well the new version of the website itself is now live, as you can see, hope you all like it. As usual any comments are more than welcome. We've also got a new crag covered, Standedge. Some nice bouldering on good rock in a lovely setting, well worth a visit. Another new addition is Honley Old Wood which has a gem of a slab. We've got a new Local section on the website that we'll use to feature local specific news, links and information. Get in touch via the contact form if you have anything you'd like to add to that section. This is a 2 item snippet of the latest Local Notices. Local Huddersfield volunteers Milnsbridge Enhancement Group [MEG] are delighted to announce the opening event of the Milnsbridge Climbing Boulder on Saturday 1st November. Situated on Crow Lane Recreation Ground in Milnsbridge, the boulder is the only one of its kind in Kirklees and will be free for all to use. The culmination of more than three years’ planning by the group, the project was primarily funded by the Colne Valley Area Committee and SITA Trust, with additional grants from the By & Buy Community Shop and Kirklees Common Good Trust. 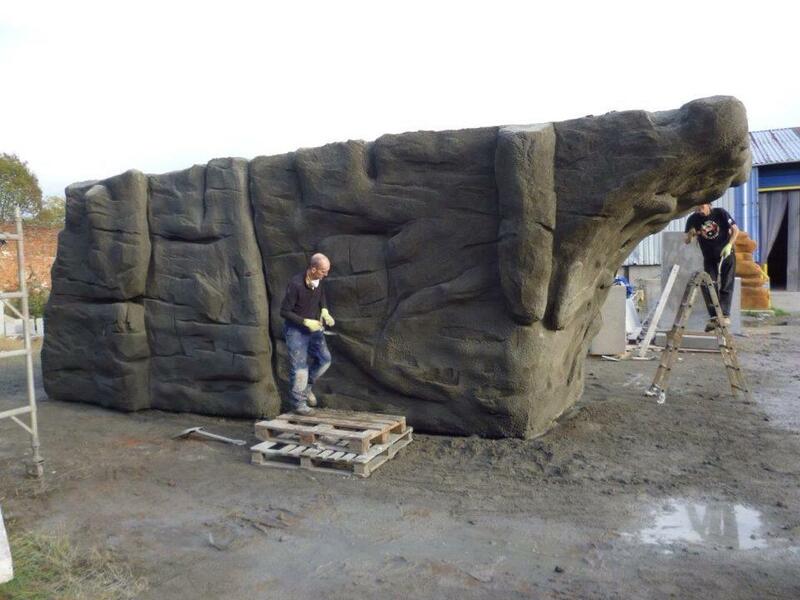 Unlike indoor climbing walls, the Milnsbridge Climbing Boulder will be outdoors and available for all to use in Crow Lane Recreation Ground which is conveniently situated on two bus routes, making it a real asset to the village and to young climbers who live nearby. The nearest similar boulders are sited across the border in Oldham and Rochdale, and there are a number in Sheffield, the climbers' Mecca. Designed and constructed by specialist manufacturers Bendcrete Leisure, the boulder is made from concrete sprayed onto a bespoke mesh-covered metal frame, with shapes and holds carved into the surface. Measuring approximately 10 metres in length by 3 metres width and 3 metres in height, it is designed to be durable and is of natural stone colour to fit in with the surrounding area. Having previously secured funding for the improvement of the children’s playground in Crow Lane Recreation Ground, MEG felt that older children and teenagers were lacking in facilities in the area. When proposing the boulder project, the group found that the idea was received with enthusiasm by local Scout groups and high schools, indicating that the boulder will be well-used, attracting climbers to the village whilst also providing young people with a constructive outlet for their energies. 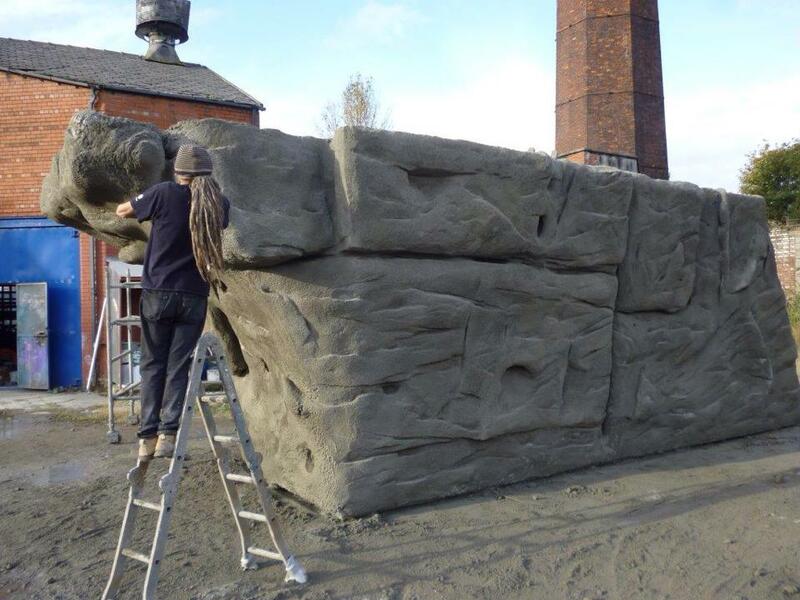 Installation is due to be completed during the half-term holiday and the grand opening event for the boulder takes place on Saturday 1st November from 2pm at Crow Lane Recreation Ground. With music, climbing instructors on hand for advice and climbing gear for sale, the event offers an ideal opportunity for keen climbers, beginners and the merely curious to come along and try out this new and unique facility. On Sunday 30th March 2014 Huddersfield Sports Centre will be the venue for this year’s Seven Summits Challenge. This sponsored climbing event will involve teams of climbers attempting to scale the height of seven famous mountains from around the world by using the various routes of the Sports Centre’s Climbing Wall. Running from 8am until 8pm participants can take part for the whole day, or just a part of it. All that is required is a commitment to raise at least £50 in sponsorship for the Holme Valley Mountain Rescue Team. As well as an enjoyable day and friendly competition, participants will get a free week of climbing at Huddersfield Sports Centre, with the wall being open from Friday March 21st to Saturday March 29th to enable people to get some last minute training in. Climbers raising £50 or more will also get a free Seven Summits Challenge T-shirt, being generously provided by Xamax clothing. Spot prizes will also be on offer throughout the Challenge.